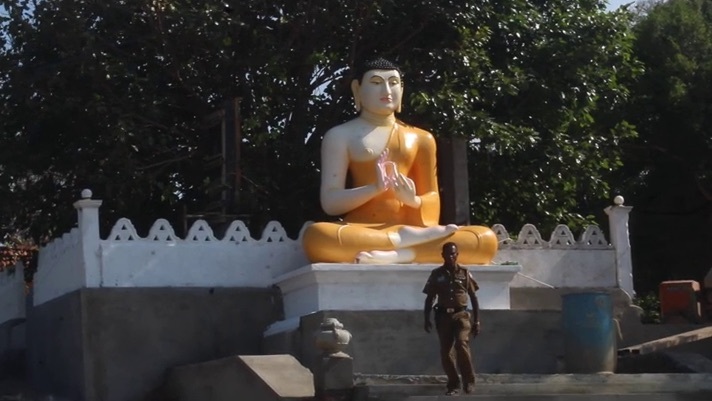 Sri Lankan police have arranged security to guard an illegally-built Buddha statue while a court injunction on its construction remains in place. Submissions on the legality of the statue encroaching a Hindu temple in Neeraviyadi, Semmalai were heard by the Mullaitivu magistrates court last week. The case was adjourned to February 12, until which time an injunction was placed on any construction work on the premises. Locals report that at least one police officer has been observed stationed by the statue at most hours of the day. The statue has been a cause of tensions locally as it was built despite fierce local opposition, with residents attempting to protect the generations-old Hindu temple that had come under Sri Lankan army occupation after the end of the war.